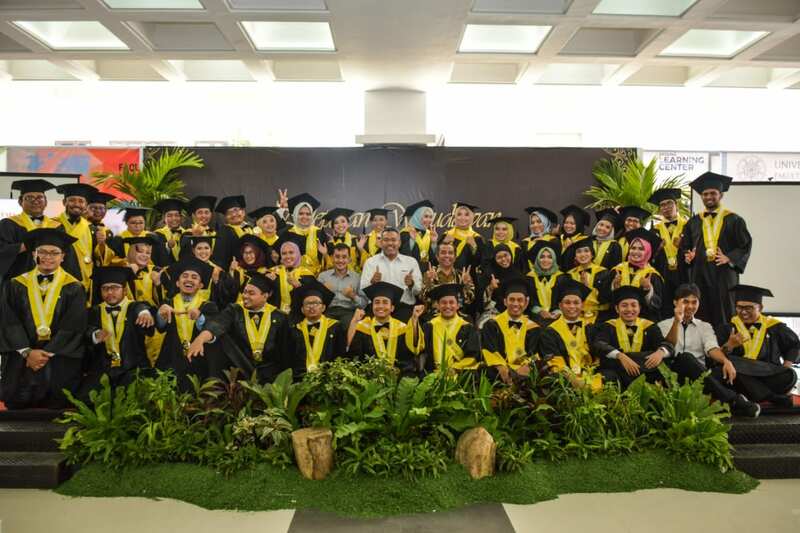 Master of Accounting (MAKSI) Faculty of Economics and Business (FEB) Universitas Gadjah Mada (UGM) organized graduation ceremony on Thursday, July 19, 2018 in Learning Center (LC) Hall, FEB UGM. The ceremony was opened by the chief of Master of Accounting FEB UGM Prof. Dr. Abdul Halim, M.B.A., and attended by Vice Dean of Finances, Assets and Human Resources FEB UGM, Kusdhianto Setiawan, Sivilekonom, Ph.D., theses supervisors and graduate companions. The graduation was attended by 69 graduates consisting of 31 male graduates and 38 female graduates. Graduate with highest GPA achieved by Giesta Artatia with GPA 3.95. Fastest study duration graduate achieved by Muh. Zulkifli with a study period of 1 year 7 months. 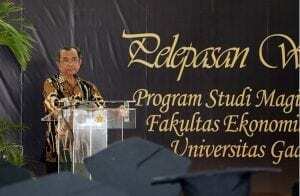 While the youngest graduate was Bobby Himawan at the age of 24 years and 5 months. Prof. Dr. Abdul Halim, M.B.A congratulated and pray for the success to all graduates. With this graduation ceremony the duties and obligations of the Master of Accounting have been completed and the graduates were wished to returned to their family and institutions where the graduates serve. Graduates with the fastest study duration, Muh. Zulkifli. delivered speech to convey his impression during his study in Master of Accounting. According to him the hardest struggle in completing the study is at the process of Student Research Seminar (SRM) or thesis exam that must be taken by students at 4 times, where at every stage of SRM need so many efforts to be passed. But Muh. Zulkifli believes in the quotes of ‘a smooth sea never made a skilled sailor’. Therefore he believes that the graduates of Master of Accounting are competent and qualified accountants. To the graduates Muh Zulkifli advised not to be proud with the Master Master degree from the University of Gadjah Mada tittle stitched in their last name. Because the title is a moral burden that must be upheld by the alumni of Gadjah Mada University by showing the excellence and competence in accordance with quality assurance held by Universitas Gadjah Mada. At the end of the event the graduates celebrate graduation by throwing the graduation cap as a symbol of the end of their study obligations.